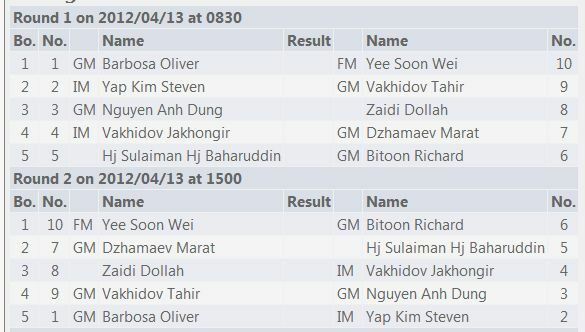 Peter Long on Chess: The Brunei Invitational Grandmaster Tournament Begins! The Brunei Invitational Grandmaster Tournament Begins! Taking advantage of the presence of Grandmasters who played in the Brunei Campomanes Memorial Grandmaster Open 2012, the Brunei Chess Federation is also organising the Brunei Invitational Grandmaster Tournament immediately after from 13-17 April. I will also be staying on as the Chief Arbiter which means it is unlikely I have any leave left to participate in the 750 Years Melaka International Chess Festival as I had earlier planned to.